For recent event, Taapsee Pannu dolled up in a white and beige custom saree from Esha Sethi Thirani. Her look was enhanced with a statement necklace from Narayan Jewels. Like her contemporary fusion look?! 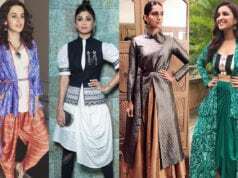 7 Celeb-Inspired Ways To Slay Your Ethnic Jackets In Style!